ePix is a perpetual calendar! As the year wears on, the picture changes but your logo will always stay visible. Promotional calendars offer the lowest cost per advertisement viewing of any promotional product as promotional calendars are seen an average of 10 times per day—every day throughout the year. A recent study by the Promotional Product Association (PPAI) found that 94% of people can recall the advertising message. Here's how the screen might look with ePix image, and various calendar layout overlays. Promotional calendars are useful, appreciated and cost-effective. They have a measurable impact with a high perceived value, and can easily be used to compliment other advertising media. This is especially true in case of ePix which is actually a fully functional software package normally sold at $10-25 depending on included images. Program is developed and supported by ArtPlus. Visit ArtPlus website to learn more about ePix Calendar. 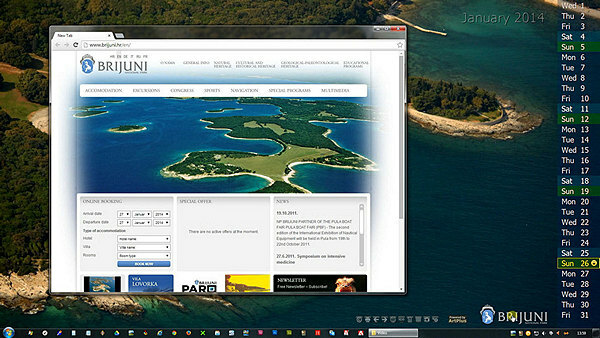 Embedded logo is also a live web-link that when clicked opens associated website in user's browser. There options available for every budget. Or, we can create calendars with YOUR images. Please contact us without any obligation, and tell us about your promotional ideas. We'll do our best to meet your needs.